Most of the days of our lives thankfully pass uneventfully. But you never know when you are going to find yourself in an emergency situation. If you happen to have spent much time in the Midwest, for example, you know that you can wake up to clear blue skies without a cloud in sight only to be fleeing from a tornado barreling up the road several hours later. 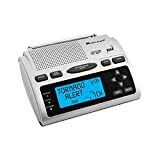 If you want to stay safe, the best way to keep apprised of hazardous weather and other emergencies is to buy a weather radio. Shopping for a weather radio for your home, office or school, but not positive where to begin in your search? Check out the product table below to compare features and prices for top models. Still not sure what types of features are important to shop for in a weather radio? Read on to learn all about them! A weather radio’s sole purpose is to pick up emergency alerts and broadcasts. These may cover weather, natural disasters, and even civil disturbances and terrorist attacks. If you live in the US, you will receive the majority of these alerts through the National Oceanic and Atmospheric Administration (NOAA), though you may choose to receive local alerts and broadcasts as well. 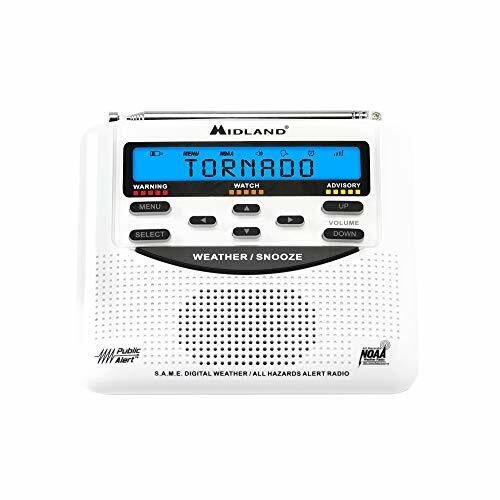 Some weather radios are known as “weather alert radios.” These models are designed to remain silent and on standby at most times. Only if they pick up a relevant alert will they turn on and play it. 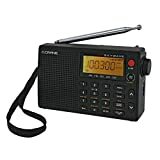 This can be a great choice if you need a radio which will conserve power. Where will you be using the radio? If you are going to be using it in a single location such as a home, workplace, or school, then you are going to want a standard weather alert radio designed to use AC power. If however you want a radio that you can take with you hiking or boating, then you will need to shop for a portable model. Portable models generally use batteries, and may occasionally be equipped with additional power options. How much control do you want over the alerts you receive? What kinds of alerts do you need? Do you just want NOAA alerts, or do you want to opt for local alerts only (or a combination)? Do you want to be able to choose the types of events which trigger an alert while silencing those that do not interest you? One or both of these logos are important to look for when you are shopping for a weather radio. Weather radios with either of these logos are up to the standards of operation set by the National Weather Service. Radios that do not include these logos may not be as high in quality. SAME stands for “Specific Area Message Encoding.” This technology allows you to receive local alerts. The majority of NOAA broadcasts cover a large geographic area. Sometimes all you want to know is what is going on near you. You don’t necessarily care what is going on several states away. Again, some radios allow you to opt to only receive certain alerts, ignoring those which are not applicable to you. While many weather alert radios are designed to hook up to AC power and sit in one location, others are small and compact and lightweight, designed to be taken wherever you need to go. These models usually rely on battery power (either replaceable or rechargeable). The best weather radios will give you some kind of audible and/or visual signal when there is a report. This could be a tone, or it could take the form of flashing lights. Many units are equipped with both capabilities. Look for a model that includes a large, clear, backlit LCD display. That way you can read what is going on at a glance. The majority of simple weather radios are designed to operate on AC power and/or batteries and no other power options. Some weather radios do include additional options, however, especially the portable models. You may for example be able to use a hand crank to power up the device. More often, these additional power options (as well as device charging options) are included in devices known as “emergency radios.” If you live in an area which is prone to power cuts, you may wish to consider an emergency radio instead of a simple weather alert radio. Some weather radios are waterproof (or at least water-resistant). When should you consider a waterproof model? This is a good feature if you want to install your device in the shower (this is more common than you might realize). Waterproofing is also important for portable models you intend to take hiking or boating. Also consider it if you live in an area which receives a lot of heavy rain and flooding. Most weather radios are backed by a one-year limited warranty. Be sure to check warranty information for any product you are thinking of purchasing. Also read customer reviews to see whether the company provides friendly, helpful service to buyers who have questions and concerns. Now you know a lot more about weather radios! 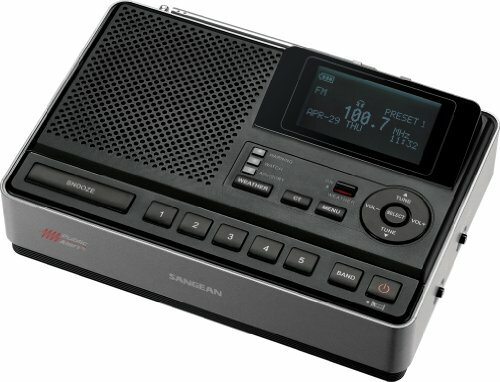 Review the list of questions and write down what is important to you in a weather alert radio. Then scroll back up to our product comparison table and take a look at some of the top products out there. We’ve made it easy for you to find the perfect weather radio to fit your needs! 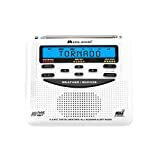 The WR-120EZ is perfect for anyone looking for a basic weather alert radio that is capable of receiving SAME (Specific Area Message Alert) signals. The upgrades that Midland put in place improve the WR-100 without raising the price tag. Like its name indicates, the WR-120EZ really is “EZ” to use. Get local weather info. The interface narrows weather alerts down to specific counties. Backlit blue display. The display is easy to read both at night and during the day. Loud alarms. The alarm noises are loud enough to wake you up if you’re asleep. Setup is intuitive and easy. The average person can setup this weather system in under 5 minutes. Alerts you when there is a weather emergency. It scans weather channels and alerts you if foul weather is approaching. Color coded alerts. The display shows you a 5 color combination that instantly reveals the exact type of weather problem that has occurred. Well written manual. The manual is clearly worded and shows you exactly how to set everything up. There’s no actual alarm bell or buzzer, just a loud voice that alerts you if foul weather is approaching. It’s impossible to disable certain kinds of alerts. This ensures that you don’t accidentally turn off the most important alerts, but it also becomes annoying when NOAA sends out false alarms. The Sangean CL-100’s best feature is its excellent speaker. It’s loud enough to wake you up if bad weather is approaching and advanced enough to make music sound good. Another thing people like about the CL-100 is the fact that all the alarms are fully customizable. Great sound quality. This radio’s speaker is quite large and powerful. Treble and bass controls. If you don’t like the defaults, you can adjust treble and bass to make music and voice sound better. Excellent display. The large display features adjustable brightness and contrast controls. Two different alarm modes. You can choose between voice or siren. You can disable any type of alert you want. All the alerts (both voice and siren) are fully customizable. It mutes itself when the message is over. NOAA’s EOM (End of Message) triggers the radio to turn itself off. Built-in FM radio. The Sangean CL-100 can be used to listen to music or talk radio if you switch it to FM mode. The instructions contain typos and translation errors. Luckily, the interface is fairly intuitive and easy to figure out. You can’t adjust the volume if you go with voice mode. That means that you’re stuck using the default sound volume if you like the voice alerts better than siren alarms. If you listen to Coast to Coast AM, you’ll probably recognize the C. Crane brand. Host George Noory is always endorsing the C. Crane radio during commercial breaks. 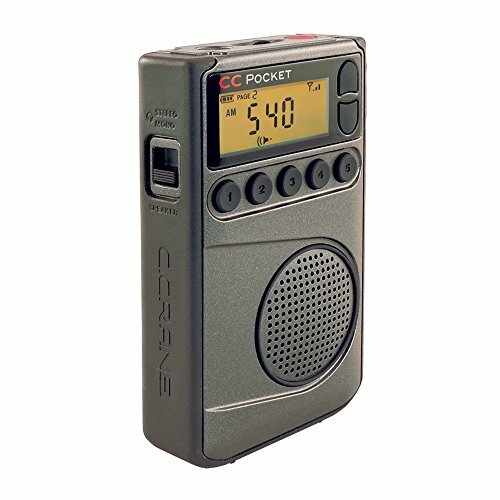 CC Pocket radio is quite old school, but it is tough and also works very well. The C. Crane’s best features are its awesome reception and its impressive battery life. Fall asleep while listening to the radio. This radio’s built-in sleep timers allow you to fall asleep while listening to your favorite radio programs. Backlit display. The display is simple, but the backlight allows you to find your way in the dark. Comes with earbuds. If you don’t own headphones, you can plug the included ones in if you want to listen to the radio without disturbing others. Solid construction. The rubberized shell prevents chips and nicks. Excellent battery life. Listen for hours on just two AA batteries. Prevents accidental button presses. The lock makes it impossible to change the station by accident. Comes with an extension antenna. The extender gives you a way to boost even the most staticy, hard-to-hear stations. The built in speaker is loud, but the sound quality is thin and tinny. It’s good for talk radio and weather alerts, but not so good for music. The interface is not easy to use. If you switch out the batteries, you have to reprogram all your favorite stations. The Midland HH50B is a compact radio which you can fit in your pocket. Bring it with you on the go, and you will always know if hazardous weather conditions are on their way. It does not have a lot of bells and whistles, but this is what keeps the price down in the budget bracket. Compact design. Measuring only 1 x 2 x 5 inches, this device is a mere 4.8 ounces. This makes small and light enough that you can stow it in your pocket or even carry it in a handbag. This makes it ideal for range of applications. Whether you simply want to know what kind of weather you can expect while you’re out and about in town or you are looking for updates while you are hiking or working in a remote location, the Midland HH50B is comfortable and easy to carry. Automatic functionality. The moment you turn this weather radio on, it begins to scan for the relevant NOAA frequency. Additionally, if hazardous weather is on the way, it’ll automatically alert you. To check whether this function is running properly, you can use the convenient test button. Great ease-of-use. This device is built to do one thing and do it really well. With respect to that promise, it delivers with flying colours. There are no distractions here–just easy weather updates. This is not the most sturdy radio. The materials are not the most durable on the market, so you may want to take care not to drop or abuse the device in any way.